Start off 2019 with five great stocks to add to your portfolio. Happy New Year, everyone! Was one of your New Year's resolutions to be a better investor in 2019? After a tough final month of 2018 in which the S&P 500 dropped 9.18%, January is looking like a good month to get started by buying great businesses that are now selling for less than they were a few months ago. The key phrase there is "buying great businesses." To quote Warren Buffett, "It's far better to buy a wonderful company at a fair price than a fair company at a wonderful price." So we asked a handful of our Fool.com contributors to highlight a great business they think investors should buy in January. Here's why they picked Berkshire Hathaway (NYSE:BRK-A) (NYSE:BRK-B), Apple Hospitality REIT (NYSE:APLE), Alphabet (NASDAQ:GOOG) (NASDAQ:GOOGL), Axon Enterprise (NASDAQ:AAXN), and Magellan Midstream Partners (NYSE:MMP). Dan Caplinger (Berkshire Hathaway): It isn't often that you get to pick up shares of Warren Buffett's company at a bargain price. But right now many short-term traders aren't happy with how Berkshire Hathaway's portfolio of publicly traded stocks has performed, and they're punishing the stock to such an extent that it's fallen to highly attractive levels. The most visible issue that Berkshire has seen lately has been the fall in shares of Apple. The iDevice giant has struggled in the face of slowing growth, and its recent revenue warning sent Apple stock down even more. As of last September, Berkshire already owned about 250 million shares of Apple, and it's entirely possible that Buffett has made further purchases since then. Because accounting rules now force Berkshire to recognize market-based changes in the value of its stock portfolio quarterly, most analysts expect the Buffett-led company to post big losses in its fourth-quarter results. That's sent some shareholders into a panic. Yet the decline in the share price has pushed Berkshire's valuation to below 1.3 times its book value, which is rare. Even if the insurance giant's book value falls somewhat in the coming quarters, the hit is likely to be far smaller than the market anticipates -- and that makes now a great time to look at Berkshire as a big potential long-term winner for your stock portfolio. Matt Frankel, CFP (Apple Hospitality REIT): Real estate investment trusts, or REITs, have actually held up quite well for the most part during the recent market weakness. One notable exception is hotel REITs, many of which have been pummeled over the past couple of months. The reason for the dismal performance? Unlike most other types of commercial real estate, hotels depend greatly on the strength of the economy. And, since the root cause of the recent market decline is fears of a global slowdown and possible U.S. recession, it makes sense that hotel stocks would take a hit. Whether you think a slowdown is coming or not, there are some rock-solid hotel REITs that should hold up fine. Apple Hospitality REIT is one that's climbed toward the top of my watch list recently. The company is a hotel owner-operator, but with a very specific focus. Specifically, Apple Hospitality REIT focuses on "select service" properties, which essentially means mid-market hotels. Courtyard by Marriott and Homewood Suites are two well-known examples of brands that are in the company's portfolio. During tough times, these hotels tend to hold up better than most for a couple of reasons. First, they tend to get lots of revenue from business travelers, who are less recession-prone than, say, vacationing families. And, in tough times, mid-market hotels lose some customers but also tend to gain some customers who would generally go to higher-end properties. Here's the best part: Thanks to the recent drop, Apple Hospitality REIT now pays a well-covered 8.2% dividend yield. So even if it takes awhile for the stock to rebound, you're still getting a nice return while you wait. Check out the latest Apple Hospitality REIT earnings call transcript. Keith Speights (Alphabet): January is a great time to pick up shares of Alphabet. For that matter, February, March, April, and any other month in 2019 that contains a vowel are great times to buy the stock, too. Alphabet is a great pick for two overriding reasons: its moat and its multiple pathways for growth. I think the odds of Alphabet losing its dominance in search engines anytime soon are lower than the chances of Miami experiencing a blizzard in July. Is it possible? Sure. Probable? No way. And as long as Google Search and YouTube keep their momentum going, Alphabet will be rolling in money. The company's other products that are used by at least 1 billion people every month -- Android, Chrome, Google Play, Gmail, and Maps -- are just icing on the cake. As for multiple pathways for growth, Alphabet appears to be poised to become a leader in self-driving cars, healthcare, and cybersecurity, just to name a few areas. The most significant of these opportunities is in self-driving cars, a market where UBS thinks the company could generate $114 billion in annual revenue by 2030. That's more than Alphabet's total revenue in 2017. 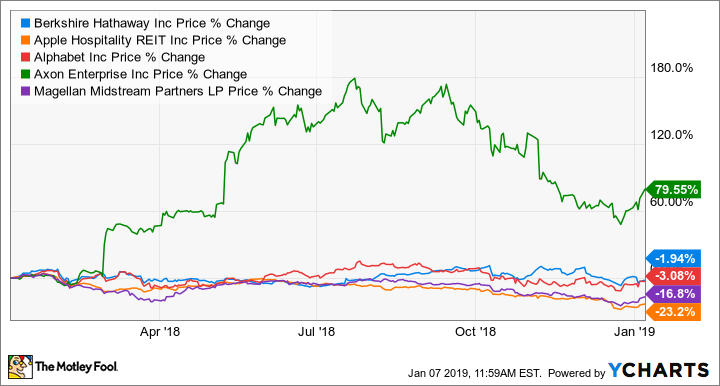 I have no idea whether Alphabet will be one of the most successful stocks of 2019. But I'm pretty confident that it will be a huge winner over the next decade and beyond. Check out the latest Alphabet earnings call transcript. Brian Stoffel (Axon Enterprise): It's been a rough stretch for shareholders of Axon -- the company formerly known as TASER International that also provides body cameras and cloud services for law enforcement agencies. Shares are down 40% from their summer highs. And yet, I think there's a lot to be excited about here. Right now the market is fretting that revenue grew by just 16% last quarter. I think that's a mistake: TASER sales were held down because police departments were waiting for the release of the TASER 7 in 2019. And revenue from Axon's software-as-a-service Evidence.com division grew 48%. While Evidence.com -- which helps store and analyze all that police footage -- accounts for only 23% of sales now, that high-margin revenue will soon be the focal point for investors. And this completely ignores the fact that the company has a slate of new products set to come out this year, the most important of which is Axon Records. The new service, expected to be rolled out in the second half of the year, aims to help reduce paperwork and get police officers out from behind the desk and connecting with the community. Sure, there will be hiccups along the way, but I think now is a great time to buy Axon. With a market cap of less than $3 billion, I believe there's lots of room for this stock to grow. Check out the latest Axon Enterprise earnings call transcript. Tyler Crowe (Magellan Midstream Partners): Oil and gas prices have been on a wild roller coaster over the past few years, which likely has kept away many investors. The nice thing for long-term investors is that there are parts of the energy industry that aren't as affected by the ups and downs of oil prices, but stocks in those sectors have dropped nonetheless. One company in this category is Magellan Midstream Partners, a master limited partnership that owns one of the largest networks of refined product (think gasoline and diesel) pipelines in North America. Unlike other parts of the oil and gas business where prospects can rise and fall with commodity prices, Magellan is like the industry's tollbooth that moves product for a fixed fee. More than 85% of its gross profits come from these fixed-fee contracts. What really matters for Magellan is how much crude oil and refined products are moving through North America. Thanks to the growth of shale, crude oil and natural gas production are at all-time highs according to the U.S. Energy Information Administration. This is providing Magellan with ample opportunities to invest in new projects and deliver guidance-raising results. Even though the future for Magellan looks good, shares of the stock dropped 19% in 2018 and now have a distribution yield of 6.3%, the highest its yield has been since 2010. For those willing to look beyond the swings in oil prices, they will find Magellan an attractive income-generating stock with great prospects. Check out the latest Magellan Midstream Partners earnings call transcript. Will Alphabet Earnings Beat Expectations Again?